Still in the afterglow of the team-bonding experience of 17 members of the Taber Fading Sons competing at the CAN/AM Challenge Cup in Las Vegas last month, another heart-warming story has emerged apart from taking home the gold medal in the three-day, four-team tournament in its division. Immediately following the gold-medal hockey game, the Fading Sons brought its bags outside to air and dry out gear in front of City National Arena, before storing them into a trailer for the long haul home from Las Vegas. 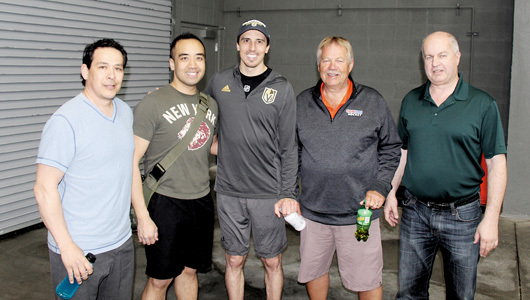 “One of our teammates decided to play a little prank on another one of our guys and placed a sign on his bag indicating ‘Free Hockey Gear,” said Chris Nguyen, one of two goalies who made the tournament trip to Las Vegas for the Fading Sons. Within minutes, a pre-teen boy who had never played a day of hockey in his life came strolling up to the arena with his grandmother, just because he had seen the Vegas Golden Knights play on television and was developing an interest in hockey. “When he saw the gear and the sign, his eyes lit up and he started browsing like it was Costco. Sure enough, our team prankster had to quickly run over and conduct some damage control,” said Nguyen with a chuckle. Members of the Taber Fading Sons started talking with the child and upon finding out why he was there and what his interests were, several different team members grabbed their own sticks, pucks and various gear and handed them over to the youngster. “The kid easily made off with a thousand dollars worth of sticks alone, smiling the whole way. And that is what the Taber Fading Sons Hockey Club is all about,” said Nguyen.